My lunches are peppered with Donburis of all sorts, mostly because I’m lazy and want everything in one compact package. Of course, it doesn’t hurt that most Donburis taste pretty good when you sort of mix them up. There’s a casual, easy to understand nature to these bowls of joy that I enjoy. The ones with cooked meat tend to get my preference, mainly because fresh fish is ridiculously hard to get at lower price points whereas places like Teepee can give me a seriously solid bowl of wagyu and rice. Pardon the Street Fighter reference, but I can think of no better way to introduce Boru Boru into this battle. 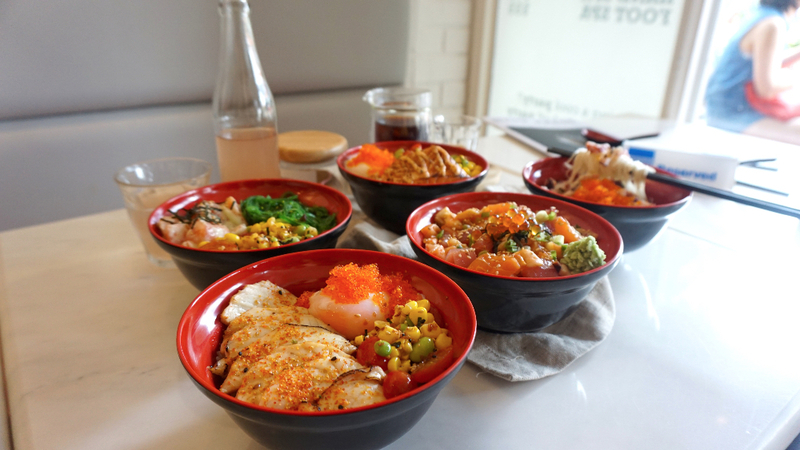 This brand new Donburi pop-up is hidden within the premises of Candour Coffee, along Bugis District’s Beach Road. 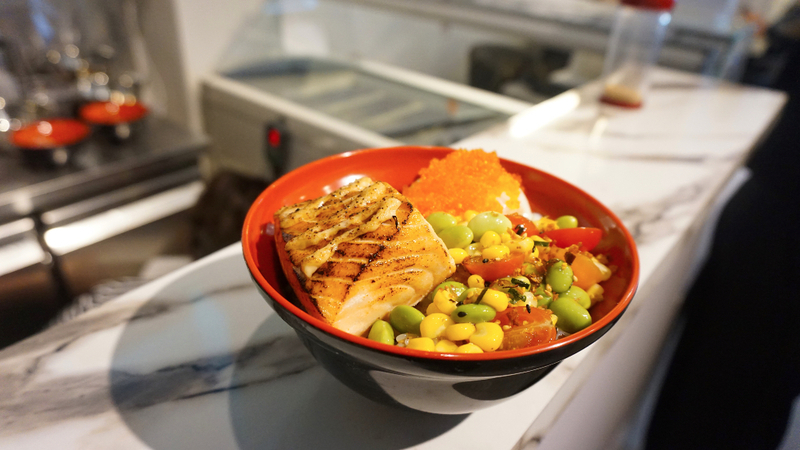 It’s only focus: to provide solid Rice Bowls at reasonable prices, and boy does it deliver on that promise. 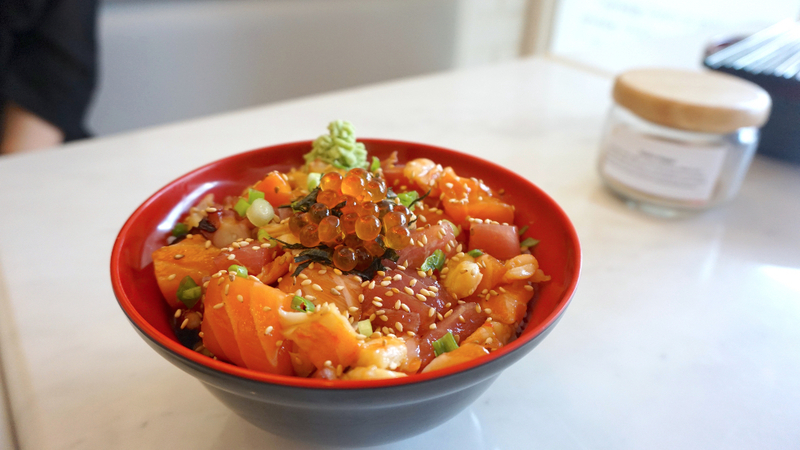 Let’s start with the heavy hitter: Boru Chirashi Don ($13.90). This bowl is filled with chunky fish that’s full of bite. None of the raw fish cubes in there were mushy, and all of them had a firmness that you could bite through. I saw salmon, tuna and Tako and Ebi in the mix, so when I went in, I was a little bit worried about the taste of the prawns. However, the freshness came through in the flavour. There was a sweetness to the prawns, which was a perfect foil for the slight tinge of Mirin in that hearty Niigata rice (Imagine my surprise when learnt about the rice). 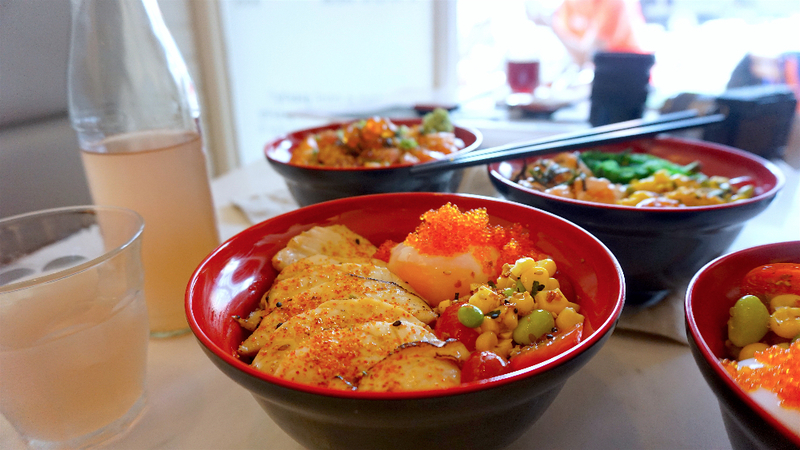 All this is accentuated by the salty satisfaction reaped from a generous serving of Ikura on that bowl. Now, this one is called the Shiro Maguro with Onsen Egg ($14.90). This tuna is blowtorched, so when you dig into the bowl, there’s a very quick fragrance of char before you hit the slight fattiness of the fish. What made the dish for me, was the spicy seasoning. There was a light fragrance, and just enough kick in the spice to get this dish going in my mouth. #Eggporn fanatics will love this one. I also enjoyed the 48 Degree Salmon Bowl with Triple Egg ($16.90), and I really don’t give a damn if anyone rubbishes Sous vide in commercial kitchens, because this literally made the dish a winner. The salmon is done to perfection – It’s juicy, firm and flakes up on the command of my rabid spoon. I was attacking this dish with all the subtlety of a miner who just struck gold, and I don’t regret it. That egg by the side just elevated things even further by coating the fish and rice in a smooth layer of joy. This dish is best when you skip doing that whole “eat the salmon piece by piece” kitsch. Just mix everything up and just start wolfing it down with reckless abandon, then thank me later. 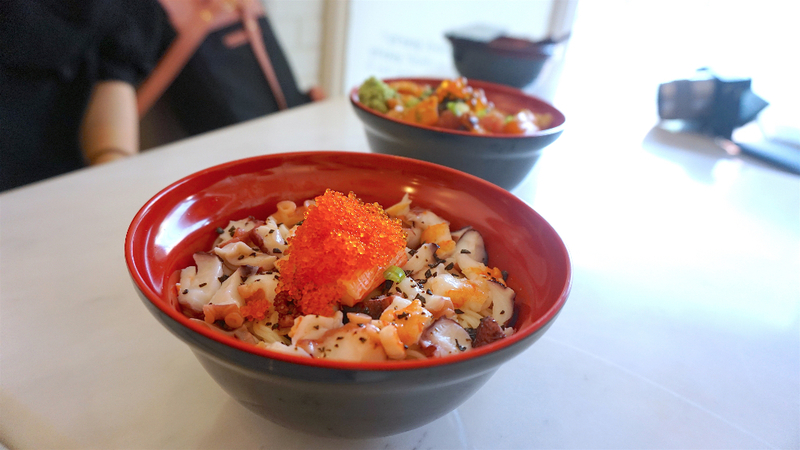 This quiet looking bowl has a lot going under that surface of Tako, Ebi, Surimi and Tobiko in this bowl of Truffle Somen ($13.90). We’re talking about those refreshingly springy Somen Noodles that lay quietly as the bedding for all of that raw fish above. It’s hard to explain, but slurping down these noodles and chowing down on that chunky Tako really gave me this contrast of textures that I wasn’t expecting. Now, add the fragrance of truffle oil, and it’s good to go. The only thing I felt was missing, was the smoothness of an egg yolk. However, I have to say that Boruto spoilt me with their version of Somen noodles, so this is no body’s fault but mine. So yes, if you want a weekday afternoon pick-me-up, this is the dish you go for. While I do think that the pop-up is interesting, it’s a fledgeling pop-up with a few configurations to an admittedly limited menu. So, if I were you, I wouldn’t go in with high expectations, looking for side dishes or anything. I also know a lot of you are tryng to suspend your disbelief. After all, it does seem almost impossible to get a Bara Chirashidon at this price point in the CBD. Just remember that what keeps this from becoming expensive is that you don’t yet have the option of adding, say, Mekajiki (Swordfish), Uni or Hamachi into the mix. Like I said, keeping it high quality and pocket-friendly is the promise, so don’t expect any bells and whistles. However, if you’re looking for a satisfying lunch in the Bugis area, look no further. This is the place.